​Below are news articles from the latest newsletter (March 2018). If you need the newsletter in its entirety, please contact Newsletter Editor Teri Wilson. Program: Ann Anzalone. "Top Ten Ways to Slow Aging and Improve Wellness". Ann is a nationally know, dynamic speaker and experienced trainer. See Luncheon page for details. Chairperson for the day: Martha Shields and Reception Table Hostess: Sally Raiteri. Hospitality Committee: Tea Cookies by Interior Design; leader Marsha Tolle. Tea Table Decor: Natalie Harwood; Pouring coffee / tea: Past Presidents Jean Short and Jean Mahan. Cookie bakers from Interior Design: Malou Hurst, Mary Ann Martens, Sandy Mefford, and Marsha Tolle. Additional bakers are: Judy Holt, Sue White, and Ann Wolf. Please remember to make your checks payable to The College Women’s Club (CWC) by Monday, February 26. Spring is on the horizon and the promise of longer days, sunnier skies, and warmer weather is something I am sure that we all welcome! I began to think about our membership and imagining what some of our members would be doing beginning in March. Many of them are planning their next “getaways” while others are deciding whether they want to come back home or extend their winter vacations. Umm – I can see Jean Mahan breathing a sigh of relief after completing her February book review. Then there is Sally Raiteri reviewing some of the final plans for the June luncheon. Ann Wolf and her nominating team are still “dancing a jig” because they broke the record for finding a “needle in a hay stack”. Marsha Tolle may have solved the issue concerning her name badge. Denise Hedley is day dreaming about more ways that CWC can interconnect with The DWC and sweet Peggy Beavin may still be asking the question – “When is President Stallworth going to get my first and last name right?” I believe that we will continue having an amazing 2018 season of fellowship, learning, growing, extending our talents and services to the outer communities. March is one of months that boasts of 31 days and although a new month comes with new challenges and purpose for us, may each of those 31 days bring many reasons of celebration for you while you drop the last month into a silent past. MARCH 4: “The Cline Show”: An opening reception for the annual exhibition showcasing college and university art and design students from around the region. Dayton Visual Arts Center, 118 N. Jefferson St., Dayton. 6 to 8 p.m. Free. The exhibition is on display through Friday, March 26. Gallery hours are 11 a.m. to 6 p.m. Tuesday through Saturday. 937-224-3822 or www.daytonvisualarts.org. MARCH 4 - 6: Miami County Home & Garden Show: This expo features contractors, landscaping companies and other businesses. Hobart Arena, 255 Adams St., Troy. 2-7 p.m. Friday, 11 a.m. to 7 p.m. Saturday, 11 a.m. to 5 p.m. Sunday. $5 advance online, $6 at the door. 937-339-2911 or www.hobartarena.com. Thank you all for your continued support of The College Women’s Club of Dayton, Ohio. We so look forward to seeing you at the Monday March 5, meeting. Stay filled with hope because hope is the only thing “uncertainty” cannot find! March Outreach: March! The month we can celebrate St. Patrick’s Day and the first day of Spring! Find one or two names of members in your CWC yearbook who were inducted into our club two (2) years before your induction. Make a phone call to them and say “Happy St. Patrick’s Day” or “Happy Spring”! You will possibly will make a new friend(s) to meet face to face at the April luncheon. CWC Board Meeting: The board meeting will be held on March 5 at 10:30 a.m. at the Dayton Woman's Club. March Newsletter Deadline: Tuesday, March 6 to Teri Wilson by either email or snail mail. Teri's contact information is in the yearbook. Three directory changes were made; please consult the March newsletter, page 4. Money Management Group --Leader: Marilyn Tolnitch (deceased). Jean Short wrote: As you all know, we lost a faithful 31-year CWC member, Marilyn Tolnitch. Marilyn left a HUGE hole in the Money Management Study Group. No one would accept the responsibility and obligation as the leader. The programs that were planned for March and April were cancelled. The checking account that was maintained was closed and the money was given to The CWC Scholarship fund in memory of Marilyn. The study group documents will be given to the historian. Unfortunately, the Money Management Study Group was dissolved as of February 1, 2018. Everything has a life span and Money Management reached the end. Book Group — Leaders: Malou Hurst. March 26 at 1:00. Reviewer Karen Weglage. Hostesses: Martha Bell, Diana Kaylor, and Willa Jean Smalley. Arts and Crafts Group — Leaders: Sandy Mefford, Linda Parker. March 27 at 10:00. Program: Hypertufal at TEJAS; Lunch afterwards TBA; Hostess: Karen Weglage. Interior Design Group — Leader: Marsha Tolle. Program: Tour of Dayton Masonic Center. Lunch: Square and Compasses Club. Hostess: Marge Lane. Book Review by Malou Hurst: At Christmas my granddaughter Meredith (12) gave me a copy of one of her favorite books, “A Wrinkle In Time” by Madeleine L'Engle. The book was written in 1962 so (of course!) I had not read it as a child. No matter! It was great fun reading it as an adult. Any book that starts with "It was a dark and stormy night" is bound to be an adventure. And what an adventure it is as we follow Meg, her brother, Charles Wallace, and friend Calvin, plus some wonderful old ladies as they travel through time to rescue Meg's father. The writing is delightful as are the characters. What fun being a kid again for an afternoon--try it! Daylight Saving Time begins at 2:00 a.m. on Sunday, March 11, 2018. Remember to turn your clocks FORWARD one hour! 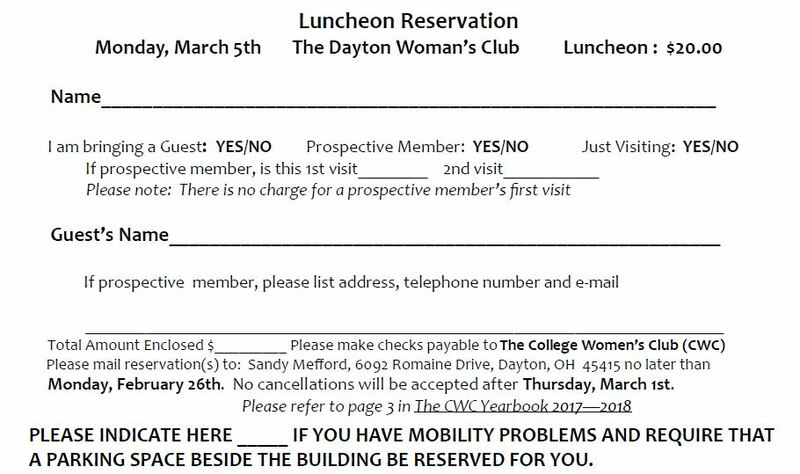 The Luncheon Reservation form for the CWC March 2018 Luncheon is provided below.